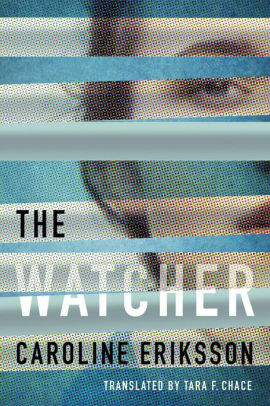 The Watcher by Caroline Eriksson is a recommended "Rear Window"-esque Scandinavian thriller translated into English by Tara F. Chace. Elena has left her husband Peter during a trial separation and has moved into a subleased townhouse. She's obviously distraught, unsettled, and unable to sleep or unpack. Her sister is trying to help her with regular Friday night dinners and checking up on her. Elena, an author, spends sleepless nights rearranging books in the bookcase. She is also watching her neighbors through the kitchen window. She discovers they are the Storm family, husband, wife, and teenage son, Leo. Soon she thinks something nefarious is happening between the Storms, and Leo, who is stopping by her house to talk to her, is increasing her anxiety about them. She is sure she is witnessing a marriage disintegrating and suspects murder may soon happen. Her watching is also spurring on her creativity, though, and she is beginning to write a new novel. Soon her writing is at a frenzied pitch and something must be coming to a deadly conclusion in both her novel and the neighbors marriage. The plot unfolds mainly through chapters from Elena's point-of-view, but there are also chapters from the Husband's point-of-view and excerpts from the book Elena is writing. At first it is difficult to see what is real and unreal. The connection between the separate narratives is tenuous and the relevance of their inclusion is unclear, but the correlation becomes more coherent as the plot unfolds. The ending brings clarity to all the narrative threads. It is an interesting novel and a quick read, although the plot is not unique and the outcome is not unexpected. There are a few plot points that were never completely resolved and I wish they were since they were an ongoing part of the narrative. Elena clearly is unstable and is an unreliable narrator, but this isn't handled quite as successfully in this novel as compared to other recent novels that have utilized this technique. If you enjoyed The Women in the Window, you might want to give The Watcher a try. Disclosure: My review copy was courtesy of Amazon Publishing via Netgalley.